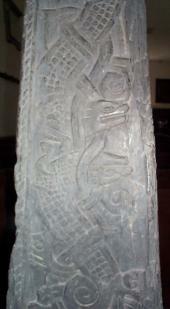 The base of what is believed to be a tapering pillar much like Thorleif's Cross. 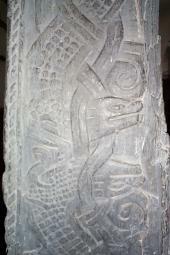 Once used as a doorway lintel it bears two pelleted dragons head to head and ornamental bands. What remains of the inscription has been translated as 'Odd raised this cross to the memory of his father, Frakki, but Thor ...'.